Fortify your home with our broadband extras – BT Virus Protect with McAfee, Parental Controls and BT Cloud included in every package – worth over £100 a year. As well as giving you the UK’s fastest wi-fi signal with our Smart Hub, our broadband packages include the most comprehensive free online security tools of any major provider. Safeguard up to 15 of your devices – PCs, Macs and Android mobiles and tablets – against viruses, phishing and other online attacks, for the entirety of your contract. You won’t get this type of protection for free from any other provider. Stay in control of what your family can access online by setting filters for inappropriate content. Our parental controls are the only ones that work both in the home and on all our 5 million wi-fi hotspots so your children stay safe wherever they are. Enjoy the peace of mind that your photos and important files are safe with up to 1000 GB of storage – easily accessible from anywhere on any device. And we’re the only major UK broadband provider to offer cloud storage – totally free when you take our broadband. With BT, you get free access to the UK's largest wi-fi network - that means more than 5 million BT wi-fi hotspots. Connect for as long as you like and save your mobile data for when you really need it. Download the BT Wi-fi app and it'll connect you to a hotspot whenever you're in range. You can find it in your app store. Enjoy the peace of mind that your precious photos and important documents are safe with up to 1000 GB of storage – easily accessible from anywhere you can get online, on any device. BT Cloud is included with all our broadband packages. Our smartphone app makes it quick and easy to manage your BT account wherever you are. You can check your usage, pay a bill, get help and more - whether it's for broadband, landline, TV or mobile. Your BT broadband comes with a BT phone line. You get inclusive calls to UK landlines every weekend. 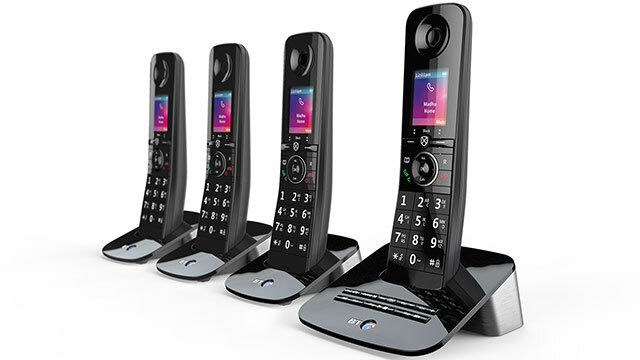 And BT Call Protect to help stop nuisance calls bothering you at home. When you’re with BT, you can sign up for free email with BT Mail. You can create up to 11 email addresses – each one with unlimited storage and in-built anti-virus protection. Want BT Mail without BT Broadband? We’ll give you the support you need for your BT Broadband. And for an extra £8 a month, BT Tech Experts can help you make the most of your computer and gadgets, 365 days a year. Switching to the UK's most popular broadband provider is easier than you think, and you can start using our 5 million BT Wi-fi hotspots as soon as you've ordered. Log in to see what personalised offers we have for you. Want to see if you can get faster broadband? Check out our great upgrade deals. Activate and manage your inclusive extras, like online security, free BT Wi-Fi and cloud storage. How to install your broadband, fix connection issues, improve your speed and more.